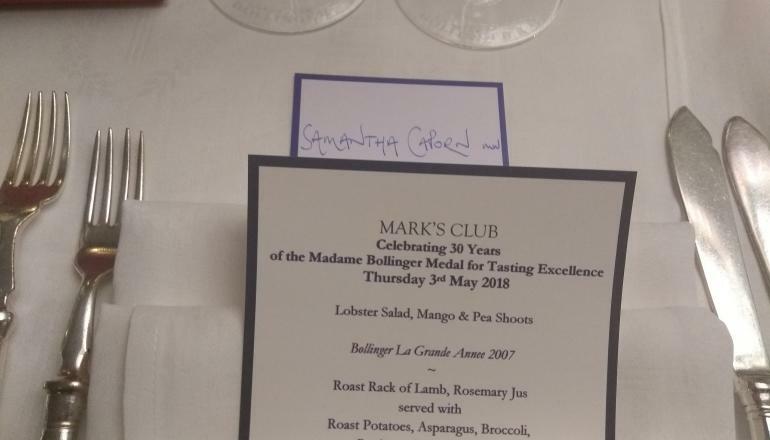 On Thursday 3rd May a rather wonderful lunch was held at Mark’s Club in Mayfair to celebrate the 30th Anniversary (1988-2018) of the Madame Bollinger Medal for Excellence in Tasting being awarded to the recently qualified Master of Wine who had shown outstanding achievement (i.e. the highest marks) in the Practical Paper amongst their immediate contemporaries. I was absolutely delighted to have been awarded this Medal in 2011 when I passed the dissertation and became a member of the Institute of Masters of Wine. The lunch was hosted by Etienne Bizot, the great nephew of Lilly Bollinger (Tante Lilly) who had presented me with my Award nearly 7 years ago, colleague Jérôme Philipon and Andrew Hawes from distributor Mentzendorff. Over the last 30 years, 29 Medals were awarded and by my maths 18 award winners were at the lunch, including Toni Paterson, an Australian MW who had flown over especially for the lunch and was flying back afterwards due to an imminent house move! Amazing commitment and a true reflection of what the Award meant and continues to mean to so many of us. A lovely sunny day meant generous quantities of the excellent Special Cuvée NV on the roof terrace with canapés followed by lunch in a private room where a surprise awaited us, of new Medals all personally engraved with our names and the year that we had passed on the back. Once they were put on we posed for some group photos and got down to the serious business of lunch. A lobster salad with mango and pea shoots was served with the R.D. 2007 which was young, taut and elegant followed by a rare tasting of their red wine (usually reserved for family members and very special occasions) which was served with lamb; the La Cote Aux Enfants 2009 from magnum, a heady spicy mix of plump red and black fruits with mineral precision. The cheese for our cheese course was brought over from France for the occasion and was paired with the exquisite R.D. 2004 which was showing excellent bottle age and complexity. The real star of the show however was a wine we were all blind tasted with and was correctly identified by the most recent Bollinger Winner, Jeremy Cukierman as R.D. 1976 and was just spectacular. My eyes have only fairly recently been opened to the wonder of older, bottle aged champagne and cracked honey and tropical fruits with bready complexity abounded. Sensational. Finally, we finished off with some Bollinger Rosé with the petits fours and also received a recently commissioned Master of Wine pin too. What a day, what amazing wines and dare I say it, what an achievement for all of us! Emotional, proud and privileged just about sums it up.